Hal Ackerman is co-chair emeritus of the UCLA Screenwriting Program. His book “Write Screenplays That Sell...The Ackerman Way” is now in its third printing and is becoming the text of choice in a growing number of screenwriting programs around the country. He has sold material to all the broadcast networks and major studios. His play, “Testosterone: How Prostate Cancer Made a Man of Me,” was the recipient of the William Saroyan Centennial Prize for Drama. Under its new title, “Prick,” it won Best Script at the 2011 United Solo Festival. ​Hal has had numerous short stories published in literary journals, among them North Dakota Review, New Millennium Writing, The Pinch, Southeast Review and Passages and most recently in the 2016 Idaho Review and Fiction International. “Sweet Day” was read by Academy Award nominee Robert Forster and is available at the Harper Collins Publishers Digital Media Cafe “The Dancer Horse” was nominated for a Pushcart Prize and is available on Audible, read by Adrian Pasdar. “Roof Garden” won the Warren Adler 2008 award for fiction and is published by Kindle; “Alfalfa” was included in the anthology “I Wanna Be Sedated...30 Writers on Parenting Teenagers.” “Belle and Melinda” was selected by Robert Olen Butler as the winner of the World's Best Short Short Story contest. It appeared in the Spring 2013 edition of the Southeast Review. Hal was a winner in the Lorian Hemingway Contest in 2014 and had fiction in fall of 2015 in the Idaho Review and in Fiction International. ​Hal has published two outstanding and successful novels in a detective series about an aging counter-culture P.I. Stein, Stoned won the Lovey award for best first novel in 2010 and was followed in 2011 by Stein, Stung. I’ve read them both and can recommend them to you highly. ​His short story collection, The Boy Who Had A Peach Tree Growing Out Of His Head… (and Other Natural Phenomena) has just been published by Hadassa Word Press. If you want to check out how to write a killer short story, read it. Hal Ackerman is co-chair emeritus of the UCLA Screenwriting Program. 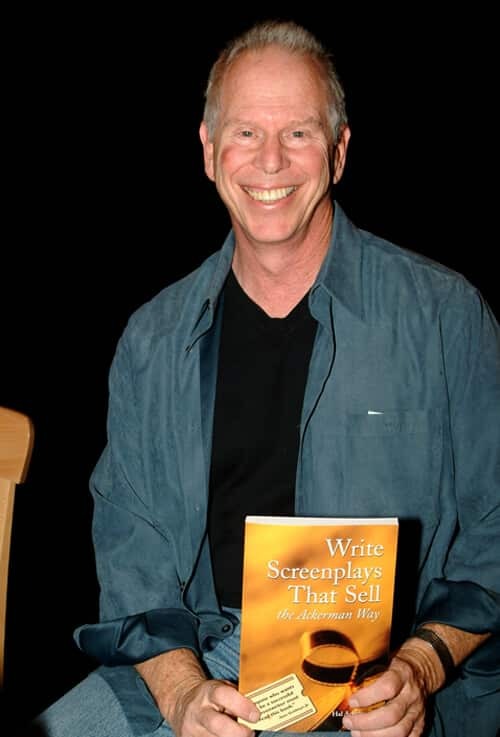 His book “Write Screenplays That Sell…The Ackerman Way” is now in its third printing and is becoming the text of choice in a growing number of screenwriting programs around the country.